Genuine goodness. Ready in 2 mins. Gluten free. Free from artificial colours, flavours and preservatives. 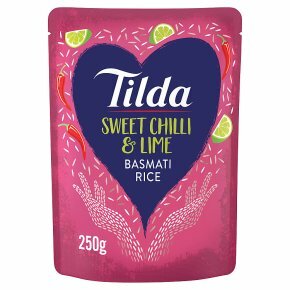 Suitable for vegetarians.Our Signature Recipes are crafted from Tilda Basmati along with the finest kitchen ingredients. Create a true Thai sensation with our Pure Basmati grains bursting with a fiery chilli kick, sweet golden honey and a zing of exotic lime. Why not try... Perfect with chicken or prawns. Add pak choi and shredded crispy duck before wrapping in little lettuce leaves.